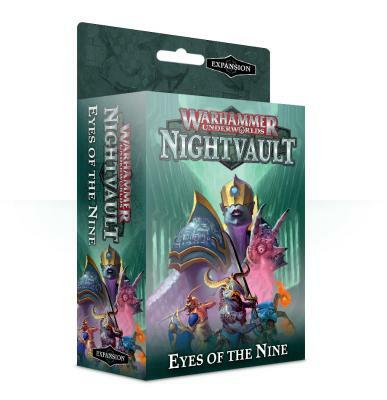 Introduce a new and unique warband to your games of Warhammer Underworlds: Nightvault and take advantage of new and different ways to play – whatever warband you use – with this set of miniatures and cards. It includes 6 striking Disciples of Tzeentch miniatures and a deck of 60 cards, 31 of which are universal to be used by any and every warband – add these cards to your arsenal and build your perfect deck. Included: - 6 Easy To Build, blue-coloured plastic Disciples of Tzeentch miniatures: Vortemis the All-seeing, K'charik, Narvia, Turosh, a Blue Horror and a pair of Brimstone Horrors; - 60 unique cards for use in games of Warhammer Underworlds: Nightvault, broken down as follows: - 9 objective cards for the Eyes of the Nine; - 10 upgrade cards for the Eyes of the Nine; - 10 ploys for the Eyes of the Nine; - 11 universal objectives, for use with any Warhammer Underworlds warband; - 10 universal upgrades, for use with any Warhammer Underworlds warband; - 10 universal ploys, for use with any Warhammer Underworlds warband.